The Garden by Sarah Stewart – A sweet story about magical rooftop garden written in the form of handwritten letters. This one is perfect for ages 4 and up, Stella my little garden helper adores it. The Complete Tales of Winnie-the-Pooh by A. A. Milne – Who doesn’t love Pooh? We’ve been reading a chapter of this every few days and it is the sweetest most calming story. The copy we have is actually from when I was little so that special element adds a bit of charm as we read. The Golden Egg Book by Margaret Wise Brown – This read is about a darling bunny who wonders about what’s in an egg. The illustrations are my favorite, they are so colorful and whimsical. A true classic. 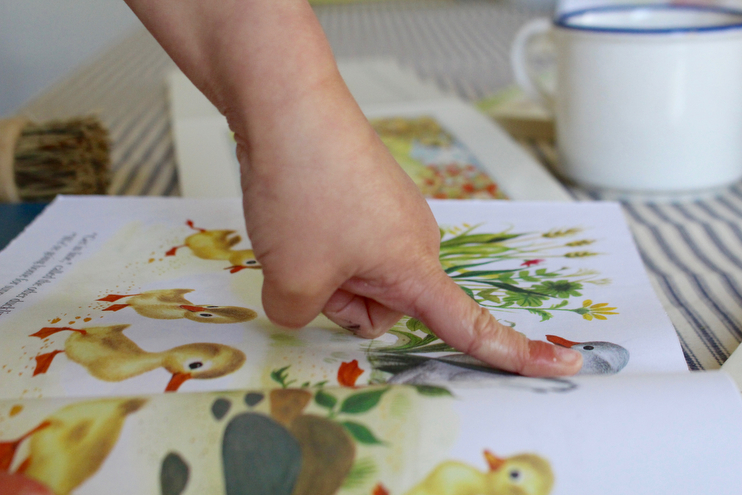 The Fuzzy Duckling by Jane Werner Watson – We adore little Golden Book Classics! This one is about a fuzzy ducky who makes his way around the farm. My grandma gave this to the kids and it always reminds me of where I grew up. Each Peach Pear Plum by Janet & Allen Ahlberg – We got this book when Stella was born and it is an absolute gem. The color pallet is just so lovely as it takes you through a bit of an eye spy game. The kids love looking for the creatures as we read along. I have given this as baby gifts and it’s always a hit. 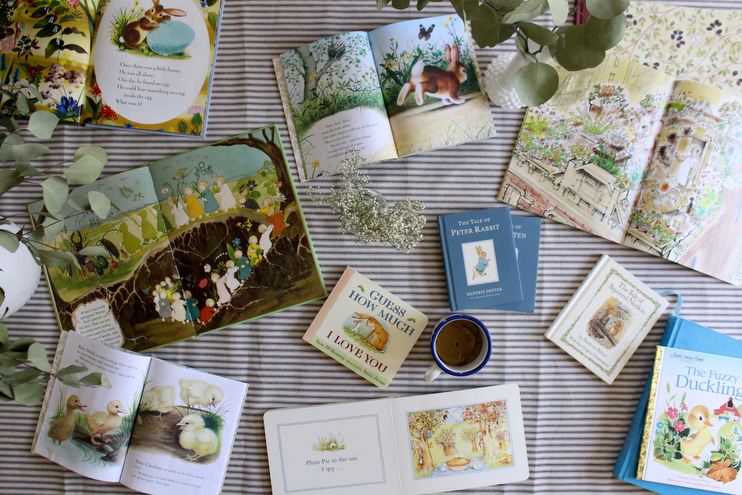 A Tiny Tale of Peter Rabbit by Beatrix Potter – Would this list be complete without the tales of mischievous little Peter? I think not! We love getting lost in Potter’s imaginary world as the bunnies hide from Mr. McGregor in his garden. ABC by Eric Carle – This flip book is a favorite of Alfie’s right now. The vibrant colors and animals are really sweet and fin for him to play with. It’s the perfect book for teaching letters too, so Stella likes it as well. The Story of the Root Children by Sibylle von Olfers – Oh this book. It was given to the kids by my birth grandmother and is very special. It is a story of the seasons as the root children spend the winter asleep underground under the care of Mother Earth. When spring comes, they wake up and go forth into the world. We read this one weekly. Home for a Bunny by Margaret Wise Brown – Here’s another Brown classic about a bunny who hops about looking for a home in the springtime. We got this for the kids last Easter. Guess How Much I Love You by Sam McBratney – We have the cardboard version of this book and it’s one I keep in my diaper bag for the kids to read when we are out and about. Reading it is like a hug. And again, the color pallet is so soothing! Baby Farm Animals by Garth Williams – If you are looking for the cutest book about baby animals this is it. It bounces around a farm and talks about baby lambs and pigs and duckies and cows. Theodore loves this book so much. I am a Bunny by Ole Risom – Chances are you have this book in your library because it is so darn sweet. Nicolas the bunny, who lives in a hollow tree, waltzes through the seasons changing butterflies and leaves and snowflakes. Its is wonderful book to read to your little ones to teach them about spring, summer, autumn and winter. Happy Easter, Curious George by Margret & H. A. Rey’s – Curious George colors Easter eggs and goes on an adventure in this book. It comes with stickers in the back which Stella was jazzed about, of course. I am always looking to expand our library with seasonal books. 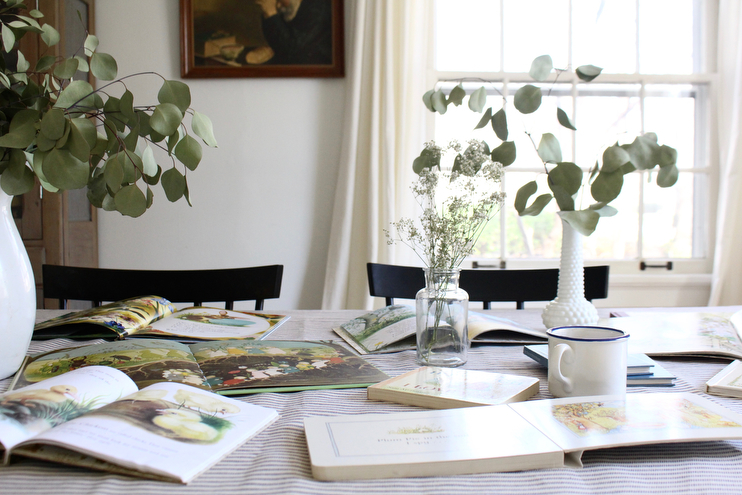 What are some of your favorite springtime reads for little ones? This sent me down a rabbit hole! A delightful one! So, one book that we love right now is Mr. Gumpy’s Outing by John Burningham. The illustrations are so sweet, and while not specifically about spring, it definitely fits into the spring/summer category. While I was looking at all your suggestions, I found the author Tasha Tudor. I had never heard of her before, but her books seem right up your alley! I think I am going to order Around the Year, The Springs of Joy, and 1 is One.